Life at Hogwarts continues in this adventure-filled sequel. After a mind-numbingly boring summer spent with the hideous Dursley's, a warning from one weird-looking elf, and a short stint of joy at the Burrow, Harry is on his way back to Hogwarts. But as always, that's where his real trouble begins. Truth be told this one is probably my least favorite of the seven. It was a little slow for me in the beginning, finally took root about half way, then finished with a bang by the end. I did have fun reviewing all the clever and witty details, and am looking forward to catching up on the next books. What a great escape they are. Care to test your knowledge of these soon to be classics? 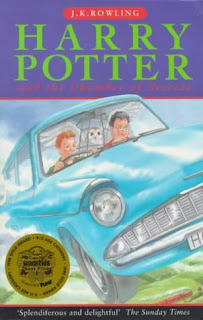 Are you but a fair weather lover of all things Potter, or a seasoned traveler through these books? I'm somewhere in the middle. Either way, I enjoyed the trip back. 1. Mr. Filch is taking what correspondence course? 2. Which Professor tells the students about the Chamber of Secrets and what class was it? 3. What does Madam Pomfrey use to grow the bones back in Harry’s arm? 4. Who was frightened by the snake and Harry during the dueling club? What happens to him and what house is he from? 5. What does Hermione leave for Crabbe and Goyle to eat to put them asleep? 6. Where in the bathroom did Harry find Tom Riddle’s diary? 7. What is Tom’s middle name? 8. What was Lockhart’s idea for a moral-booster? 9. Where did the Malfoy’s keep their dark artifacts hidden in their house? 10. Who was the headmaster of Hogwarts while Riddle was there? 11. What did Dumbledore teach during Riddle’s time? 12. Who delivered a singing Valentine to Harry? 13. How many signatures were needed on Dumbledore’s Order of Suspension? 14. When the mandrakes had acne and were becoming moody and secretive, what did that mean? 15. What was Aragog’s wife’s name? 16. What is fatal to a basilisk? 17. What did Ginny see Percy doing that he didn’t want her to tell? 4) Everyone, but I think you're referring to Justin Finch-Fletchley, from Hufflepuff, who later is frozen. 6) On the floor, having washed out of the toilet. 14) They were fast leaving childhood or fast approaching adulthood or something like that. 15) Crap, this is the chapter I always skip because it's boring...I want to say it started with an M or a G, but I'm thinking "Merope" which is obviously wrong. I have no idea Lula! Good question. Crap, you're good. Didn't stump you much this time did I. A few small details were different, but dang, excellent! 17 - extra points if you know who Percy's girlfriend was and what house she belonged to? See, her name DID have an M and a G in it, haha! That's what my synethesia gets me. I remember the color of the name but not the name itself. Argh, I bow to your HP greatness. Reading these are making me anxious for the movie. sigh.. I CAN'T WAIT FOR THE MOVIE!!!! I don't even like the movies, and I'm still jumping out of my seat waiting for it, haha! Although 5 was pretty good, in comparison to the rest of them. Thanks for the link, Lula! I cannot wait for the new movie this summer. I gave my son this quiz, and he got 11 right, 6 wrong. I think he's read this one less than the first. Trixie - I can't wait for the movie to come out, either! My second son just started reading the series. We'll see how much he rereads and retains. my daughter, megan, got 2 of these wrong. she couldn't remember the name of Aragogs wife, but she knew it began with an 'M' and she thought the diary was in the toilet. . .